All laws applicable in Queensland are authorised by the Parliament of Queensland, with the exception of specific legislation defined in the Constitution of Australia, criminal law applying under the Australia Act 1986 as well as older laws passed by New South Wales and the United Kingdom because the state was a former colony. 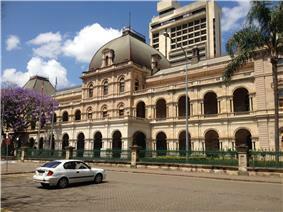 The Parliament was founded 22 May 1860, less than a year after the Colony of Queensland was created in June 1859. It was convened at a converted former military and convict barracks located on Queen Street, Brisbane. Immigration was an important issue for the early Parliament. Population growth was encouraged with new settlers enticed by land ownership. The official flag of Queensland was adopted in 1867. In 1915, Queensland became first state to make voting compulsory at state elections. The Assembly has 89 Members of Parliament (MPs). These are intended to represent approximately the same population in each electorate. Voting is by the Optional Preferential Voting system (OPV). Elections are held approximately once every three years. The role of the monarch in Parliament is to give royal assent to legislation. This function is in practice exercised by the Governor of Queensland, who conventionally will never refuse assent to a bill that has passed the Legislative Assembly. The party or coalition with the most seats in the house is invited by the Governor to form government. 45 votes as a majority are required to pass legislation. Both independents support the Labor government on confidence and supply. ^ "Almost 150 years strong" (lift out section). ^ Tony Moore (3 January 2013). "Compulsory confusion at the ballot box". Brisbane Times (Fairfax Media). Retrieved 3 January 2013. ^ "Parliament accused of censorship over camera ban". Brisbane Times (Fairfax Media). 30 May 2008. Retrieved 3 January 2013. ^ Daniel Hurst (15 May 2012). "Simpson elected state's first female Speaker as Parliament resumes". Brisbane Times (Fairfax MEdia). Retrieved 5 January 2013. ^ a b c d e Wanna, John; Tracey Arklay (2010). The Ayes Have It: The History of the Queensland Parliament 1957-1989. ANU E Press. pp. 12–15.